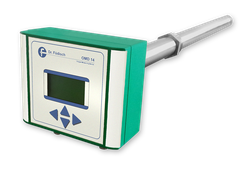 All Dr. Födisch Umweltmesstechnik AG emission measuring devices or systems can in principle also be used for various process applications. Furthermore devices for special requirements and applications are designed by Dr. Födisch technical-team. Extractive solutions are in particular suitable and used. Thereby sensitive measurement technology is not directly exposed to the often harsh exhaust conditions. By modifying the sample extraction even the most difficult applications (high temperatures, very high dust content, corrosion) can be solved.